Eight of the 10 Big 12 teams have played at least two games (Oklahoma State squares off at Texas-San Antonio tonight and West Virginia meets Monmouth tomorrow), so while it’s still too early to draw sweeping conclusions, it is a good time to take a look at some early revelations with Feast Week just around the corner. Dedric Lawson’s been just okay. Just one week in and we’ve already seen some of the inconsistency for which the preseason All-American became known during his two years at Memphis. Even though Lawson struggled to a 5-of-18 shooting night against Michigan State, he was good enough to contribute 20 points along with 14 rebounds, two blocks and a pair of steals. In his Allen Fieldhouse debut against Vermont on Monday, however, he was a total non-factor from start to finish as the Catamounts pushed him around and held him scoreless for the first time in his career. 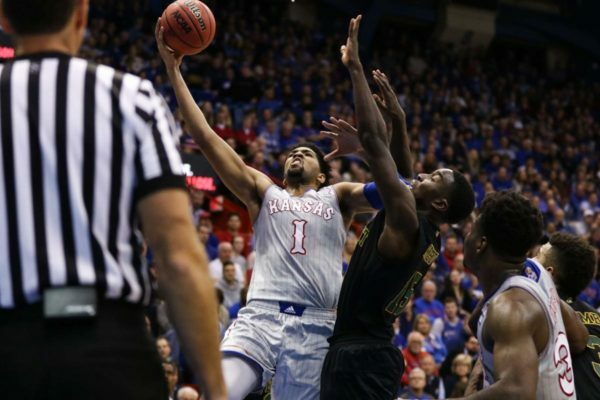 Among his many skills, Lawson is a tremendous passer out of the paint, but Kansas’ insistence on running so much of its offense through Udoka Azubuike presents challenges in terms of fit and strategy when they’re both on the floor. The junior shouldn’t have any problems on Friday against Louisiana, whose rotation includes just one player taller than 6’6″, but it’s fair to have expected a little more from the big man in his first two games in Lawrence. It might be a while before we know how good West Virginia is. There isn’t much shame in losing to mid-major darling Buffalo in overtime, but the fact that the Mountaineers put up a defensive turnover rate of just 12.8 percent at home and were fairly mediocre on the offensive glass in allowing a 13-point second half comeback should dispel any notions that this season will be business as usual in Morgantown. Bob Huggins‘ team will have opportunities to clean things up, but with this weekend’s Myrtle Beach Invitational lacking top-end competition and just one meeting against a KenPom top-50 team remaining (Florida in Madison Square Garden) before conference play, determining where this team belongs in both the Big 12 and national picture might take some time. With tip-off mere days away, we’re continuing our 2018-19 Big 12 coverage by going around the league team-by-team. Be sure to check in throughout the season and follow Big 12 correspondent Brian Goodman on Twitter @BSGoodman. Well, that didn’t take long. Just two years after extending its investment in basketball by hiring Jamie Dixon away from Pittsburgh, TCU made its first NCAA Tournament in 20 years. It wasn’t always pretty, as the Horned Frogs started just 5-8 in Big 12 play before rallying in late February, but fans need not be focused on such things when a drought is that long. Dixon’s squad sported the Big 12’s best offense, led by an army of shooters and a big man in Vladimir Brodziansky who could operate both inside and out. While he and Kenrich Williams played pivotal roles, they aren’t irreplaceable, and the return of the entire backcourt as well as some additions will go a long way towards picking up the slack. 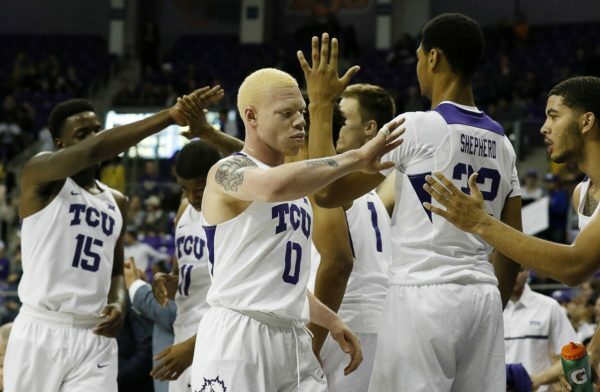 As the curtains open on the 2018-19 season, TCU is arguably the best team in the entire state of Texas, a notion that would have been impossible to entertain just a couple of short years ago. Offense is going to be this team’s calling card once again. Jaylen Fisher and Alex Robinson make an excellent backcourt duo, as both are very comfortable with the ball in their hands. Robinson is better at creating for others than for himself, but he’ll have plenty of teammates to take advantage of his strength. Desmond Bane, who led the Big 12 in eFG% and true shooting percentage as a sophomore, is back for another go, and Kouat Noi and redshirt freshman Lat Mayen will help spread the floor as well. The interior is going to be a question mark on both ends of the floor, as Williams’ ability to pressure multiple positions will be missed, but a top-four finish in the league and an appearance in the NCAA Tournament’s second weekend are fair expectations as Dixon aims to build on last season’s momentum in Fort Worth. Despite Villanova beating three Big 12 teams in decisive fashion on its way to the national title, the 2017-18 campaign was another strong one for the league. Here are some takeaways from the year that was and a handful of early thoughts on the main storylines as summer draws near. The league began the process of rehabilitating its March reputation. 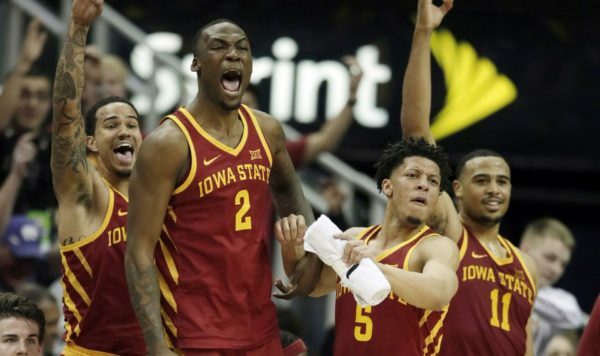 After some disappointing results in the last few NCAA Tournaments, the Big 12 took a step forward this year in sending four teams to the Sweet Sixteen, three teams to the Elite Eight and one to the Final Four. Perhaps most notable was Kansas State‘s head-turning voyage to the Elite Eight, which put Bruce Weber on steadier ground from a job security perspective entering next season. 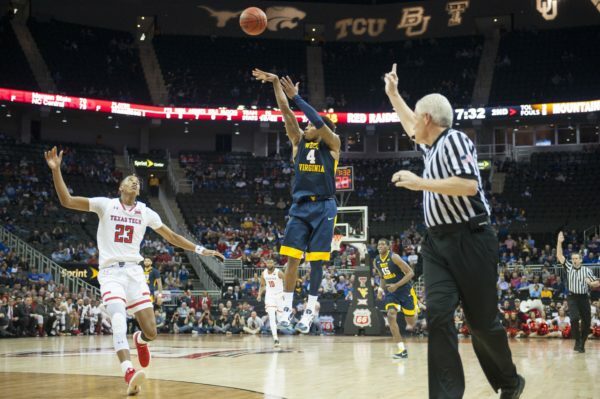 We also watched Texas Tech break into the second weekend with star guard Keenan Evans playing on a broken toe, and West Virginia gave Villanova the toughest game of the Wildcats’ championship run. The league’s national perception won’t change significantly until a team other than Kansas makes the Final Four, but Villanova’s victory over the Jayhawks became easier to swallow when they cut down the nets last Monday night in San Antonio. All told, the conference logged one of its best postseason runs in recent years. What will Kansas do with its last scholarship? When the buzzer sounded on their national semifinal loss to Villanova, the Jayhawks were already one over the scholarship limit for the 2018-19 season. That potential dilemma, however, worked itself out when Malik Newman and Lagerald Vick both opted to forgo their remaining eligibility and pursue professional careers. With one scholarship now available, fans can expect Kansas to ramp up its pursuit of five-star wing Romeo Langford to round out its roster, but the Jayhawks will likely be the preseason #1 team in the country regardless of what happens on that front. 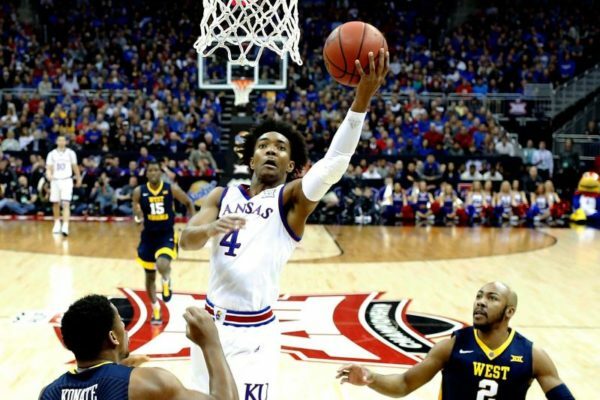 If Langford signs elsewhere, Kansas could scour the graduate transfer market for some outside shooting to pick up some of the slack left by Newman and Vick as well as the graduations of Svi Mykhailiuk and Devonte’ Graham. In that light, bringing in a proven three-point threat from the existing market seems to make good sense unless Udoka Azubuike surprises the college basketball world by declaring and staying in the 2018 NBA Draft. RTC will be providing coverage of the NCAA Tournament from start to finish. Matt Patton (@pattonm08) is in Boston for the East Regional this weekend. West Virginia controlled the first 30 minutes of the game. Villanova was uncharacteristically sloppy. Donte DiVicenzo and Mikal Bridges were totally lost. Even when the Wildcats avoided turnovers, they took contested (often rushed) shots. If Jalen Brunson was the best player on the floor — keeping the Wildcats within striking distance — it was his former teammate on the other side, Jevon Carter, who set the tone for the game. With 11:08 remaining, the Mountaineers were up six and looked like they had seized control. To that point Villanova was 2-of-11 in the half with a whopping zero points in the paint. Then everything fell apart for Bob Huggins’ team. And then Villanova settled down. From that point, Villanova outscored West Virginia 36-18 the rest of the way. Brunson started things off, as he always seems to do, with an and-one, and the Wildcats ripped off 11 points in a row to regain control of the game. The Mountaineers missed nine straight shots over the next five minutes before finally getting something to drop at the 6:25 mark. Villanova, on the other hand, made 10 of their last 14 field goal attempts while committing only two turnovers (both of which came when the outcome was effectively decided). But even so, the game felt much closer than the final score. West Virginia compounded their closing woes with missed layups, open threes and free throws. Villanova is the favorite to cut down the nets in San Antonio. The Wildcats looked rattled at times against West Virginia’s relentless press, but they also run the prettiest offense in college basketball, bar none. They space the floor as well as an NBA team, and Brunson will be the best player on the floor no matter the possible remaining opponent (even against Duke). And considering that Villanova looked totally rattled (apart from Brunson), they were only down six to West Virginia tonight. Their ceiling is as high as any team remaining, but their floor is quite a bit higher than the rest of the field. Star of the Game. Jalen Brunson, Villanova. Brunson kept the Wildcats from being run out of the gym during the first 30 minutes of the game. He looked every bit the National Player of the Year candidate that he is, creating opportunities for himself as well as his teammates. He broke the West Virginia press with ease for most of the night. He drew fouls when necessary. It felt like he never missed an open look. His closing line was 27 points and four assists in 37 minutes of floor generalship. Rush the Court is providing comprehensive coverage of the NCAA Tournament from start to finish over the next three weeks. Today and tomorrow we reset each of the four regions. New Favorite: #1 Villanova (32-4). The Wildcats did nothing to put their ‘favorite’ status into question over the weekend. In fact, they may have actually established themselves as the new odds-on favorite to win the whole thing. 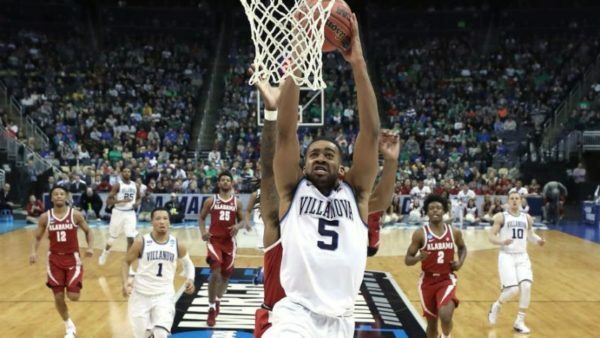 After handling #16 seed Radford by 27 points in the First Round, Villanova put on a second half clinic against #9 Alabama in the Round of 32, outscoring the Crimson Tide 49-21 over the final 20 minutes and finishing the game with 17 made three-pointers. On the weekend, in fact, Villanova shot a combined 31-of-68 (46%) from long range, its spread offense looking more lethal than ever. Now ranked #1 by KenPom with the most efficient offense in America, the Wildcats roll into Boston looking Final Four ready — especially considering the season-ending injury to Purdue center Isaac Haas in the other half of this bracket. Horse of Darkness: #5 West Virginia (26-10). We had to put someone here, right? In an overall bracket riddled with chaos, the East Region remained more uniform than most, leaving #5 West Virginia as the “dark horse” if there is one. Entering the NCAA Tournament, KenPom gave the Mountaineers only a 42.6 percent chance of reaching the Sweet Sixteen, odds that changed dramatically once Marshall upset #4 Wichita State on Friday. West Virginia now heads to Boston where it will be a clear underdog against #1 Villanova, which is probably just how Bob Huggins and his aggressive group likes it. Biggest Surprise (First Weekend): #13 Marshall (25-11). Hunter became the hunted in San Diego, where #4 Wichita State — usually the one busting brackets — fell victim to Marshall’s high-powered attack. Entering Friday, the Shockers had won at least one game as a lower-seeded team in five of the last six NCAA Tournaments, including a run to the Final Four as a #9 seed in 2013. Simply put, Wichita State feels comfortable wearing the underdog hat — even in games in which it is favored, like that 2014 classic against #8 seed Kentucky. But this time around, Gregg Marshall’s group felt like Goliath, and perhaps that unfamiliar pressure wore on the Shockers down the stretch. While Wichita State tightened in the second half, the Thundering Herd just kept on shooting. The result was an upset we did not see coming. Completely Expected (First Weekend): #2 Purdue. We fully expected Purdue to reach the Sweet Sixteen. What we did not expect was how much uncertainty it would endure to get there. After pounding Cal State Fullerton in the First Round, the team announced that senior Isaac Haas — the Boilermakers’ second-leading scorer and premier post-threat — would miss the remainder of the NCAA Tournament with a fractured elbow. Subsequent reports revealed that he might see limited action. Finally, his arm brace failed to clear NCAA safety standards, meaning the Boilermakers would have to beat Butler without him. They did, thanks in large part to the brilliance of Vincent Edwards (20 points), but not before two days filled with doubt. Today and tomorrow we will be rolling out our region-by-region analysis for the 2018 NCAA Tournament. Here, Tommy Lemoine (@hoopthink) breaks down the East Region from top to bottom. Also, be sure to follow our RTC East Region handle on Twitter for continuous updates over the next two weeks (@RTCEastRegion). Favorite: #1 Villanova (30-4, 14-4 Big East). Sound familiar? Villanova enters the NCAA Tournament as a #1 or #2 seed for the fifth straight season, a remarkable run that has included great success (see: 2016 National Championship) and bitter disappointment, with the Wildcats failing to reach the Sweet Sixteen in 2014, 2015 and 2017. This year, expect something closer to the former. While less defensively stout than in recent seasons, Villanova boasts the second-most efficient offense in the KenPom era behind only Wisconsin in 2014-15. 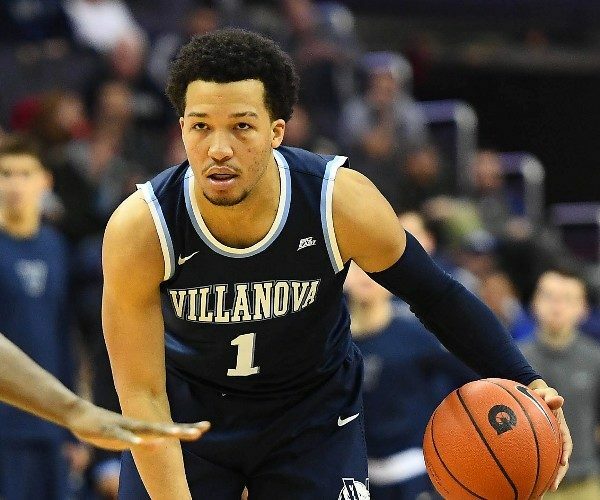 Big East Player of the Year Jalen Brunson (19.4 PPG) might be the most reliable late-game scorer in college basketball, while 6’7″ wing Mikal Bridges (18 PPG, 1.6 SPG, 1.1 BPG) — a projected lottery pick — is among the sport’s premier two-way players. Jay Wright’s club may not be deep, but its 7-to-8 man rotation is cohesive and often blisteringly lethal. A potential Sweet Sixteen match-up with West Virginia could present some challenges, but it’s hard to see the Wildcats stumbling until a possible Elite Eight game with Purdue. Should They Falter: #2 Purdue (28-6, 15-3 Big Ten). As recently as early February, Purdue ranked among the top 10 nationally in both offensive and defensive efficiency while arguably looking like the best team in America. Then it lost three games in a row, battled injury concerns and looked prone to fatigue. Lucky for the Boilermakers, this year’s early Big Ten Tournament means they will have had a full 11 days of rest by the time they tip off against Cal State Fullerton on Friday. That bodes well for an offense — the country’s second-most efficient behind Villanova —predicated on lights-out three-point shooting (42% 3FG) and pounding it underneath to 7’2″ center Isaac Haas (14.9 PPG). The extra rest should also help Purdue’s struggling defense clamp down more like it did for the first three months of the season. Between the match-up problems Haas and guard Carsen Edwards (18.5 PPG) present in addition to a manageable bottom half of the bracket, Matt Painter’s group is the next best bet after the Wildcats. Grossly Overseeded: #9 Alabama (19-15, 8-10 SEC). There was nothing too egregious in the East Region, but it’s still hard to look at Alabama’s 15 (15!) losses and sub-.500 conference record and feel good about the Crimson Tide as a #9 seed. On Thursday, they were one Collin Sexton missed-layup away from the NIT. Two SEC Tournament wins later — albeit against quality opponents — and they are seeded higher than a Butler team that’s been an NCAA Tournament lock for weeks (with wins over Villanova and Ohio State to boot). Every passing postseason where a Big 12 team gets bounced in embarrassing fashion or fails to maximize its potential by way of an otherwise-excusable loss becomes another pock mark on the conference’s reputation. Oklahoma got the Big 12 off the schneid with a Final Four Run in 2016, but it hasn’t been enough. There’s never been more pressure on the league to produce than there is this year, and seven teams will get a bite at the apple. Another Big 12 team has to break through eventually… right? Best Case: The recent breakouts of Malik Newman and Silvio De Sousa continue into the NCAA Tournament, buying additional time for Udoka Azubuike to recover from his MCL injury. With the Jayhawks’ starting center at full strength for the second weekend, Bill Self makes his third Final Four as the Kansas head coach. Worst Case: Foul trouble and a cold shooting night around the perimeter spell another early exit, this time in the Round of 32. Best Case: Keenan Evans, Zach Smith and Justin Gray take advantage of a nearly week-long break and get healthy, and the Red Raiders channel the best version of themselves to their first ever Elite Eight appearance. Worst Case: The Red Raiders continue to slide and are defeated at the hands of Stephen F. Austin, a team that bears some striking similarities to the West Virginia team that bested Tech in two of their three meetings. Another weekend of Big 12 action is in the books, and with it another dramatic set of games, each one carrying significant implications on both the league standings and the at-large picture for the NCAA Tournament. With Kansas and Texas Tech drawing back to even with four games remaining — including a crucial head-to-head match-up this coming Saturday — there’s still plenty of intrigue even if Saturday night’s events in Lawrence gave the impression that a 14th straight conference title for the Jayhawks is likelier than the standings suggest. Starting with the weekend’s marquee game between Kansas and West Virginia, Bob Huggins’ comments on the officiating, while valid, also left me ambivalent. Huggins certainly made a strong point when he pushed for referees to be made available to media after games in a fashion similar to that of coaches and players. The game as a whole would benefit, but as The Kansas City Star’s Sam Mellinger wrote in his postgame column, Huggins is probably not the right messenger for that idea when you consider his own team’s style of play. That said, while the 35-2 free throw disparity between the Jayhawks and Mountaineers drew the lion’s share of attention, caution should be exercised from draw sweeping conclusions. After all, the Mountaineers held a double-digit lead with fewer than 10 minutes to go despite the difference in free throw attempts, and West Virginia attempted just six shots at the rim all game long — compared with 13 by the Jayhawks. When a team fails to attack the tin, it will have a much harder time getting foul calls, especially on the road. Again, that isn’t to absolve John Higgins’ officiating crew from some responsibility here, but proper context is the name of the game when it comes to wide free throw disparities, even in extreme cases like this one.